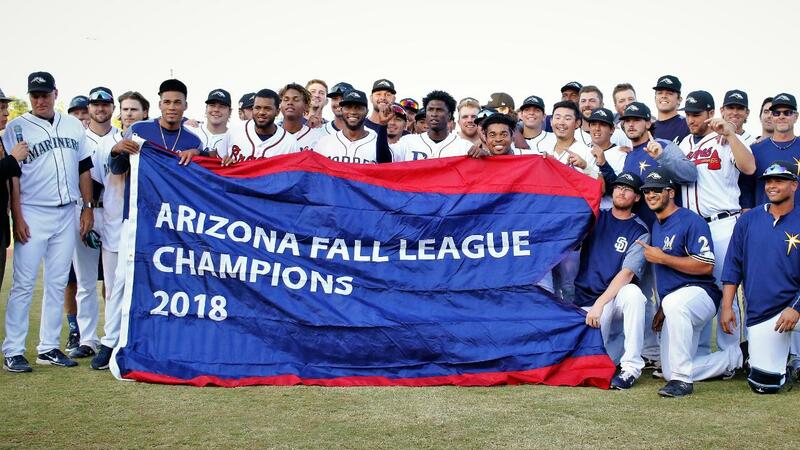 Former Carolina Mudcats infielder Keston Hiura (2018) hit a game tying RBI single in the ninth and former Mudcats outfielder Braxton Davidson (2016) hit a walk-off home run in the 10th as the Peoria Javelinas captured their second straight Arizona Fall League title with a 3-2 victory versus the Salt River Rafters on Saturday, November 17 at Scottsdale Stadium in Arizona. Hiura and Davidson were among six former Mudcats to play in the AFL championship game and nine total former Mudcats between the two championship game teams. The AFL finale also featured former Mudcats Monte Harrison (2017), Jordan Yamamoto (2017), Daniel Brown (2018) and Jon Olczak who all played major roles in the game and played for the Mudcats over the last two seasons. Former Mudcats players Weston Wilson (2017/2018), Miguel Sanchez (2018), Trent Grisham (2017) and injured catcher Mario Feliciano (2018) were also on the Peoria roster, but did not play in the game. Here's a look at how each former Mudcats player performed in the 2018 Fall League season and how they played during their respective time with the Mudcats. Keston Hiura, who was named the Arizona Fall League's Most Valuable Player before the championship game, came through with a game tying RBI single in the ninth that tied the game at 2-2. Hiura, Milwaukee's No. 1 rated prospect, went 1-for-4 with a walk, a strikeout and a RBI in Peoria's championship victory. He also ended up slashing .323/.371/.563 while leading the AFL with 33 RBI and 31 hits in 2018. Hiura also finished third in the AFL in runs with 19 and was second in home runs with five. Hiura, 22, began the 2018 season with the Mudcats before a June 1 promotion to Double-A Biloxi. He bid farewell to the Carolina League by going 5-for-5 with two home runs, three runs and two RBI on May 31 in Lynchburg all while setting career highs for hits and home runs in a game before his promotion the following morning. Hiura finished the month of May batting .377/.437/.664 with Carolina and totaled a stellar 1.101 OPS over 29 games while earning both both Carolina League and Milwaukee Brewers MiLB Player of the Month award honors for the month for May. Hiura finished May leading the Carolina League in OPS (1.101), runs (29), hits (tied, 46), extra-base hits (21) and doubles (13). He also left the Carolina League ranked 2nd in batting (.320), 1st, 2nd in hits (66), 1st in doubles (16), 1st in extra-base hits (26), tied for 1st in slugging (.529), tied for 2nd in runs (38) and 1st in total bases (109). Braxton Davidson capped a solid Fall League season by going 2-for-5 with the walk-off blast that clinched Peoria's second straight championship title. In all, Davidson finished tied for the AFL lead in home runs with six and slashed .227/.354/.530 over 18 Fall League games. He also totaled 27 RBI and a .885 OPS while playing first base for the Javelinas. Davidson, 22, played for the Mudcats in 2016 during the club's final season as an affiliate of the Atlanta Braves. Davidson finished that 2016 season with a team high 10 home runs over a team best 128 games and slashed .224/.344/.360 overall. He also totaled 96 hits including 24 doubles, two triples and 63 RBI. Davidson, did however, also set Carolina's franchise record for strikeouts in a season with 184 over the course of the 2016 campaign. He was originally selected with the 32nd overall pick of the 2014 Major League Draft by the Braves as on outfielder out of T.C. Roberson High School in Asheville, NC. Davidson played for Atlanta's Class A Advanced affiliate, the Florida Fire Frogs, in 2017 and 2018 seasons. Reliever Daniel Brown allowed a hit, but pitched through a scoreless seventh for Peoria in the AFL championship game. His solid Fall League finale performance came after a strong overall AFL run that saw him pitch to a 3.00 ERA over nine appearances. The lefty also held opponents to a .190 average against and totaled 17 strikeouts against four walks over 12.0 innings with the Javelinas in this year's Fall League season. Brown, 23, spent the entire 2018 season with the Mudcats and went 7-4-2 with a 4.20 ERA over 39 games. He also finished the year with 61 strikeouts against 34 walks in 64.1 innings pitched. Brown was especially stingy out of the Carolina pen in July 2018 when he totaled 25 strikeouts over 20.2 innings and nine appearances. He also totaled 22 strikeouts over 17.0 innings (eight games) between July 18 and August 17, 2018 (3-0, 2.65 ERA, 7 BB, 11.65 SO/9). Reliever Jonathan Olczak worked the eighth in the AFL title game and held the Rafters scoreless while also striking out one. He followed former 2018 Mudcats teammate Daniel Brown and was one of six Peoria relievers to hold Salt River without a run in the game. Olczak, 25, appeared in just two games for the Mudcats in 2018 before receiving a transfer to Double-A Biloxi in April. The NC State product did, however, appear in 11 games for Carolina during the 2017 season and went 1-1 with two saves and a 4.95 ERA over 20.0 innings pitched. Salt River's Monte Harrison drove in the first run of the Fall League championship game while giving his club a 1-0 lead in the second inning. Harrison, who was traded by Milwaukee following his time with Carolina in 2017, went 1-for-4 overall in the game with a RBI and a strikeout. Harrison, 23, joined the Mudcats shortly after the All-Star break in 2017 and went on to hit .278/.341/.487 with 64 hits including 16 doubles, a triple, 10 home runs and 16 stolen bases over 59 Carolina League games. He originally began the 2017 season with Low-A Wisconsin where he hit .265/.359/.475 with 11 home runs, 32 RBIs and 11 stolen bases. Overall, Harrison finished the 2017 campaign with a 20/20 year after totaling 21 home runs and 27 stolen bases between Low-A Wisconsin and High-A Carolina. Milwaukee later packaged Harrison in a trade with the Miami Marlins that brought over recently named National League MVP Christian Yelich to the Brewers. Harrison played for the Jacksonville Jumbo (Double-A, Southern League) Shrimp during the 2018 season. Jordan Yamamoto started for Salt River in the AFL title game and totaled six strikeouts against five walks over 4.0 scoreless frames. Yamamoto, who was traded by Milwaukee following his time with Carolina in 2017, also allowed just two hits and totaled 77 pitches (43 strikes) before leaving the game with a 2-0 lead after four full frames. Yamamoto, 22, pitched for Carolina in 2017 and finished his stellar year with the Mudcats at 9-4 with a 2.51 ERA, .223 average against and 113 strikeouts over 111.0 innings pitched. He ended up leading Carolina League pitchers with at least 110.0 innings pitched in earned run average, but did not reach the minimum number of innings (112.0) required to officially qualify for the league's ERA title. He was later traded by the Brewers to the Miami Marlins following the 2017 season and played for GCL Marlins (Rookie, Gulf Coast League), Jupiter Hammerheads (High-A, Florida State League) and Jacksonville Jumbo Shrimp (Double-A, Southern League) during the 2018 season. Utility man Weston Wilson did not play in the Fall League championship game, but did appear in 13 games with Peoria overall in his AFL season. The versatile infielder/outfielder played at first and third for the Javelinas and slashed .375/.455/.583 with 18 hits including two doubles, a triple, two home runs and seven RBI. Wilson, 24, first played for the Mudcats during the 2017 season and played in 43 first half games before a mid-season transfer to Low-A Wisconsin. He later returned to Carolina for the end of the second half and in all hit .241/.298/.326 with 63 hits including 11 doubles, one triple and three home runs over 73 Carolina League games. Wilson then returned to the Mudcats for the 2018 season and would earn team MVP honors (Willie Duke Award) after hitting .274/.330/.446 with 105 hits, 23 doubles, two triples, a team best 13 home runs and a team high 62 RBI over 105 games. Wilson also earned Carolina League Player of the Month (and Milwaukee Brewers MiLB player of the month) award honors for July after batting .436/.481/.681 with a 1.162 OPS over 27 games. He also finished July tied for first in the Carolina League in OPS (1.162), 1st in average (.436), 1st in OBP (.481), 2nd in SLG (.681), 2nd in runs (26), 1st in hits (41), tied for 4th in extra-base hits (12), 2nd in total bases (64), tied for 3rd in home runs (5) and tied for 4th in RBI (23). Wilson also finished July as the overall MiLB (full-season teams) leader in average (.436) and tied for 4th in OPS (1.162). He later finished the 2018 season with Double-A Biloxi before being selected to represent Milwaukee in the AFL. Outfielder Trent Grisham did not play in the AFL championship game, but did appear in 17 games overall during the 2018 AFL season. Grisham played in 17 Fall League games and slashed .150/.301/.233 while totaling nine hits, four runs, one triple, one home run, six RBI and 13 walks. Grisham, 22, played in a team high 133 games for Carolina in 2017 and totaled a team best 98 walks. He also slashed .223/.360/.348 with 102 hits including 21 doubles, six triples and eight home runs. Grisham, playing as Trent Clark at the time, also totaled 45 RBI and 37 stolen bases during his 2017 season with Carolina. Reliever Miguel Sanchez did not pitch in the Fall League title game, but did appear in six AFL games while going 1-0 with a 3.60 ERA. He also totaled eight strikeouts against three walks over 10.0 innings pitched. Sanchez, 24, pitched in 10 games with Carolina in 2018 before receiving a mid-May promotion to Triple-A Colorado Springs and eventually landing with Double-A Biloxi. Sanchez went 1-0 with a save and 2.53 ERA during his time with Carolina in 2018. He also totaled 30 strikeouts over 21.1 innings pitched and held opponents to a .182 average against before moving up in Milwaukee's system. Sanchez additionally went 1-0-1 with 25 strikeouts over his final 17.0 innings and seven appearances with Carolina before his promotion. Catcher Mario Feliciano appeared in just two Fall League games before finishing the season on the disabled list. The 19-year-old catcher began the 2018 season on the disabled list and did not join the Mudcats until June 1, 2018. Feliciano, 20, played in 42 games with Carolina and hit .205/.282/.329 with 30 hits, seven doubles, a triple, three home runs and 12 RBI in 2018. The Puerto Rican born catcher set a career high with four hits on July 28, 2018 in Potomac after going 4-for-5 with a home run.